Why use a ContextMenuStrip control? Use the ContextMenuStrip when you want to display a menu of commands when the user right clicks on a specific control. To manually assign a ContextMenuStrip to a control, you need to set the control’s ContextMenuStrip property to the desired ContextMenuStrip control. Note: Not all controls have a ContextMenuStrip property, but the majority do. 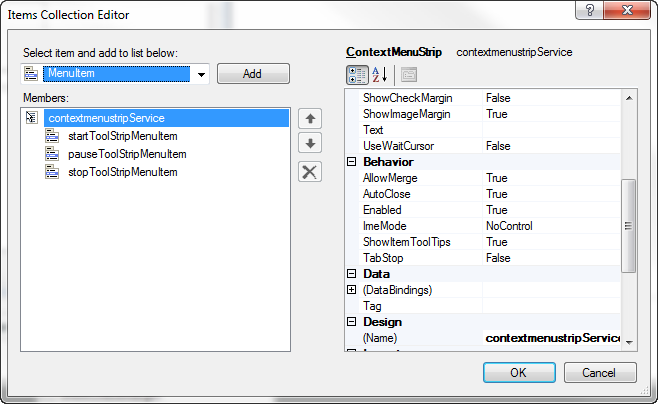 Refer to the Show method example below to see how to manually display a context menu. This property gets or sets a value indicating whether space for a check mark is shown on the left edge of the ToolStripMenuItem. If the ShowcheckMargin is set to False and there is no image set, the check mark will display in the image location. This property gets or sets a value indicating whether space for an image is shown on the left edge of the ToolStripMenuItem. This property gets or sets a value indicating whether ToolTips are to be displayed on ToolStrip items. When this property is set to True, the tooltips set on each menu item will be displayed when the mouse hovers over it. This property contains all the menu items that belong to a ContextMenuStrip. The designer offers two ways of editing and adding menu items to your context menu. 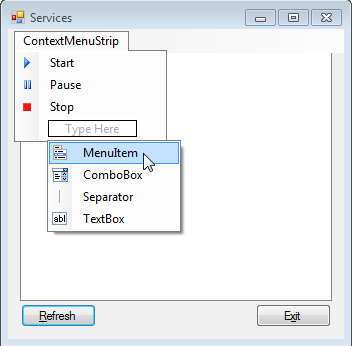 Once you’ve selected the ContextMenuStrip, a menu strip will be displayed directly in the designer, allowing you to visually add and remove menu items. Note: You can edit the menu item’s properties using the Property Pane. The Menu Item Collection Editor allows you to add and remove MenuItems and access the properties at the same time. There are different types of menu items you can add to your context menu. MenuItem – Is a selectable option displayed on a ContextMenuStrip. It is the general purpose read only menu item which supports sub menu items. Image The image that will be displayed next to the menu item. CheckState Indicates the state of the menu item. CheckOnClick Indicates whether the item should toggle its selected state when clicked. DropDownMenuItems Specifies a submenu to display when the item is clicked. Functions similar to the ContextMenuStrip’s items property. ShortcutKeys The shortcut key associated with the menu item. This is a quick way of assigning a short cut key to a command. Text The text displayed on the menu item. Visible Determines whether the menu item is visible or hidden. Click This event occurs when the MenuItem is clicked. Use this event to process the menu command. You can also use the ContextMenuStrip’s ItemClicked event as an alternative. CheckedChanged This event occurs whenever the Check property is changed. Use this event to react to the check change as it occurs. CheckStateChanged The event occurs whenever the CheckState property is changed. Use this event to react to the check state change as it occurs. 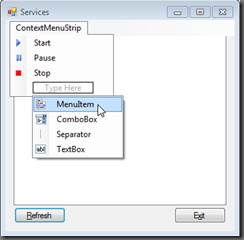 ComboBox – Displays a combo box on a ContextMenuStrip. The combo box menu item behaves like the traditional ComboBox control. See the Spotlight on the ComboBox Control blog article for more details. Items This property contains a collection of items that are displayed in the combo box. SelectedIndexChanged This event occurs when the value of the SelectedIndex property has changed. Use this event to react to the selection change as it occurs. TextBox – Displays a text box in a ContextMenuStrip which allows the user to enter text. The text box menu item behaves like the traditional TextBox control. See the Spotlight on the TextBox Control blog article for more details. Text This property contains the text that is displayed in the text box. TextChanged This event occurs when the value of the Text property changes. Use this event to react to the selection change as it occurs. Separator -Represents a static line used to group the drop-down items of the ContextMenuStrip control. Typically you will add menu items via the designer, but there are times when you may want to add a menu item dynamically via the script editor. This event occurs when a menu item is clicked. Use this event as a general catch all event for the menu items. It allows you to react to the menu item clicks without having to set each individual menu item’s click event. This event occurs when the ContextMenuStrip is opening. Use this event as a trigger to initialize the menu items such as enabling / disabling or hiding menu items. if($service -ne $null)#Is there is a service object? This event occurs when the ContextMenuStrip has closed. You can use this event to handle state changes or selection changes in a combo box menu item if you do not handle their state changes as they occur. Specifies that the ContextMenuStrip control was closed because another application has received the focus. Specifies that the ContextMenuStrip control was closed because an application was launched. 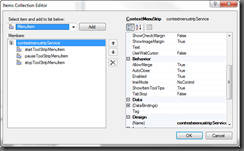 Specifies that the ContextMenuStrip control was closed because one of its items was clicked. Specifies that the ContextMenuStrip control was closed because of keyboard activity, such as the ESC key being pressed. Specifies that the ContextMenuStrip control was closed because the Close method was called. This method closes the ContextMenuStrip control. This method displays the context menu. Use this method when you wish to manually trigger the context menu. In the example above, the context menu is displayed whenever a user right clicks on a node in the TreeView control. You can download the ContextMenuStrip example from our Downloads section. This sample builds upon the Spotlight on the TreeView Control example.